A crucial bar accessory, the bowl-shaped Winco JST-1 Stainless Steel Julep Strainer strains liquids easily and thoroughly. The holes of these julep strainers are sized perfectly to prevent large pieces from passing through, which results in a smoother cocktail. 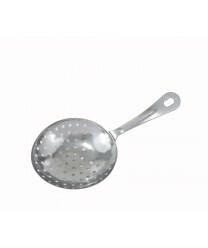 Made of stainless steel, these cocktail strainers feature a large hole in the handle for convenient hanging.